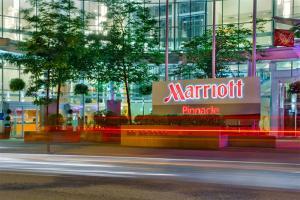 Elegance, convenience and modern comfort await you at the Vancouver Marriott Pinnacle Downtown Hotel. Situated in the heart of the city, and just moments from popular attractions including Stanley Park and Rogers Arena, the hotel is the ideal base for a fun-filled vacation. Settle into your room and enjoy striking views of downtown Vancouver and the harbor. Enjoy delicious international cuisine at Showcase Restaurant & Bar. Stay healthy with a visit to the fitness center, or take a dip in the indoor pool. Located a 5 minute walk to Coal Harbor and Vancouver Convention Center, and approximately a 25-minute drive to Vancouver International Airport. Stanley Park, Cruise Ship Terminal, Roger Arena, BC Place Stadium, Vancouver Aquarium.